Transmitted by various tick species, depending on the subspecies of Babesia canis. 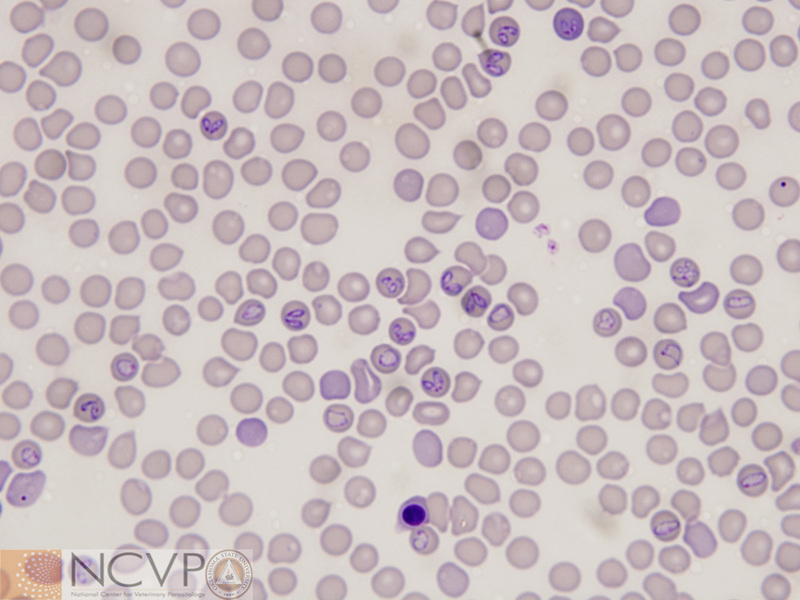 Piroplasms of Babesia canis in an erythrocyte on a Romanowsky stained blood film from an infected dog. 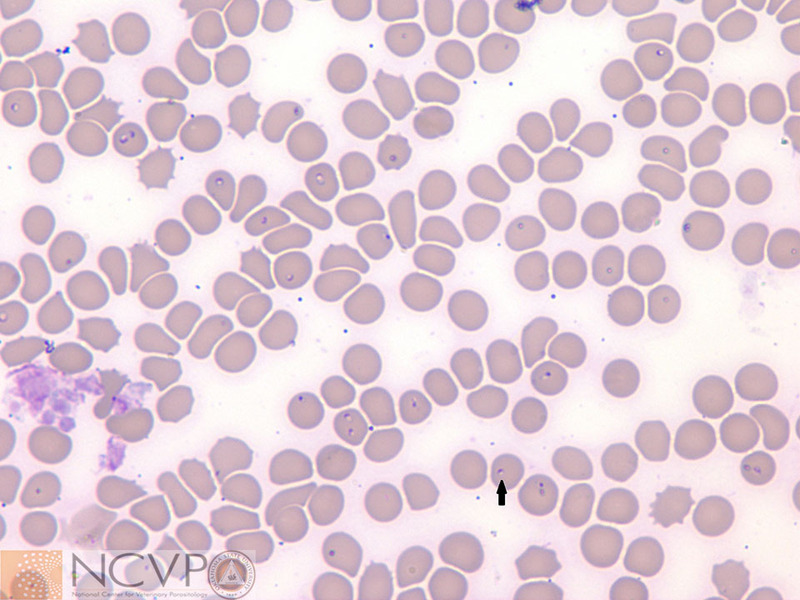 Piroplasms of Babesia canis are 4-5 µm, pear-shaped, and typically paired. Piroplasms are the infective stage to feeding ticks. Transmitted by Rhipicephalus (Boophilus) spp. Piroplasms of Babesia bigemina in erythrocyte on Romanowsky stained blood smear from an infected cow. 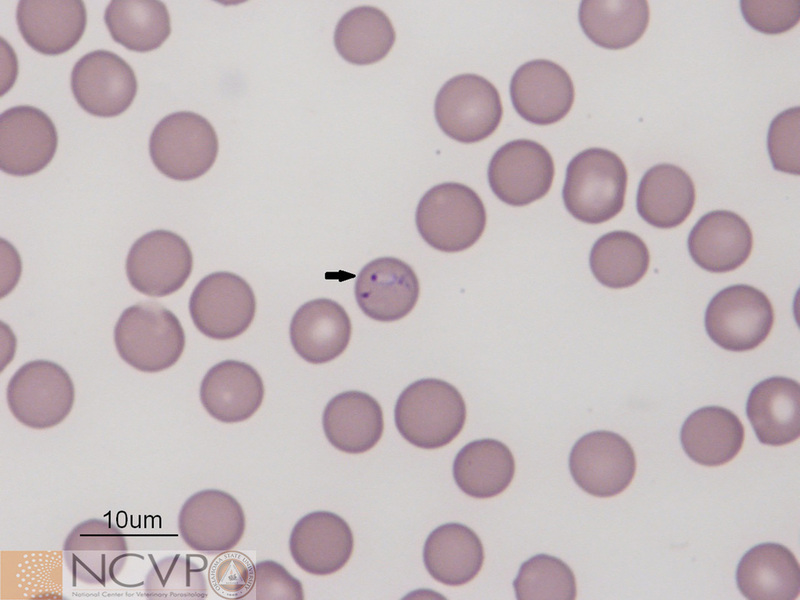 Piroplasms of Babesia bigemina are 4.5 x 2.5 µm, teardrop-shaped, and typically paired. Piroplasms are the infective stage to feeding ticks. A tick vector has not been definitively demonstrated in the United States. 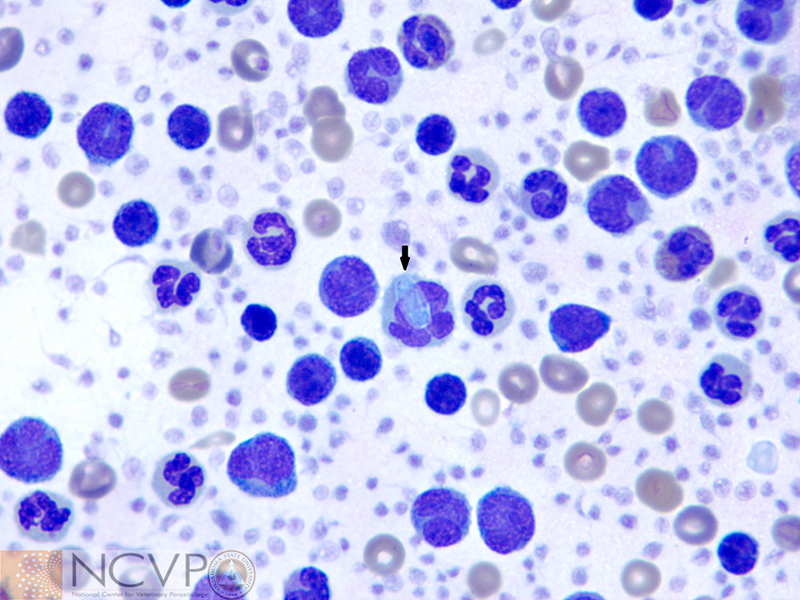 Piroplasm of Babesia gibsoni in an erythrocyte on a Romanowsky stained blood film from an infected dog. 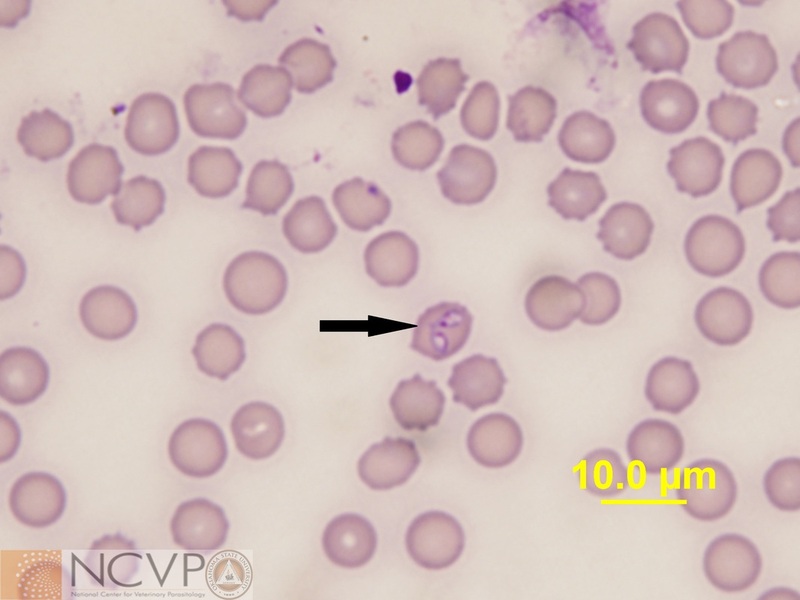 Piroplasms of Babesia gibsoni are 1-3 µm and signet ring shaped. In other parts of the world, Babesia gibsoni is transmitted by Rhipicephalus. sanguineus and Haemaphysalis species. In the Unites States, Rhipicephalus sanguineus is a suspected tick vector, but most Babesia gibsoni transmission is thought to occur through dog fighting. Romanowsky stained blood film with numerous erythrocytes containing Cytauxzoon felis piroplasms. Piroplasms are the infective stage to feeding ticks. Amblyomma americanum is thought to be the primary natural tick definitive host and vector. Transmitted by Amblyomma maculatum. Characteristic "onion skin" cyst of Hepatozoon americanum in a histologic muscle preparation from an infected dog. 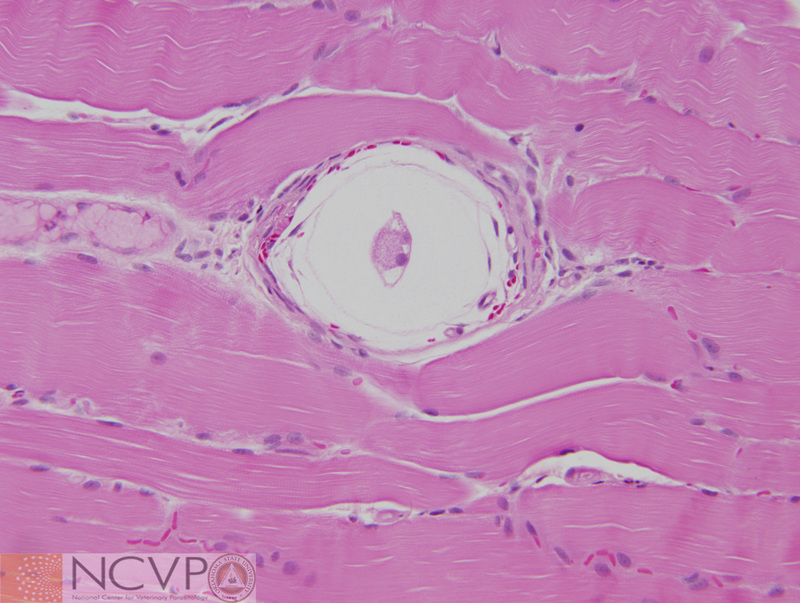 These cysts are associated with parasite schizogony within leukocytes situated between striated muscle fibers, and are pathognomonic for infection with this parasite. Here, the parasite has invaded the host cell and induced cyst formation, but has not yet begun to undergo schizogony. 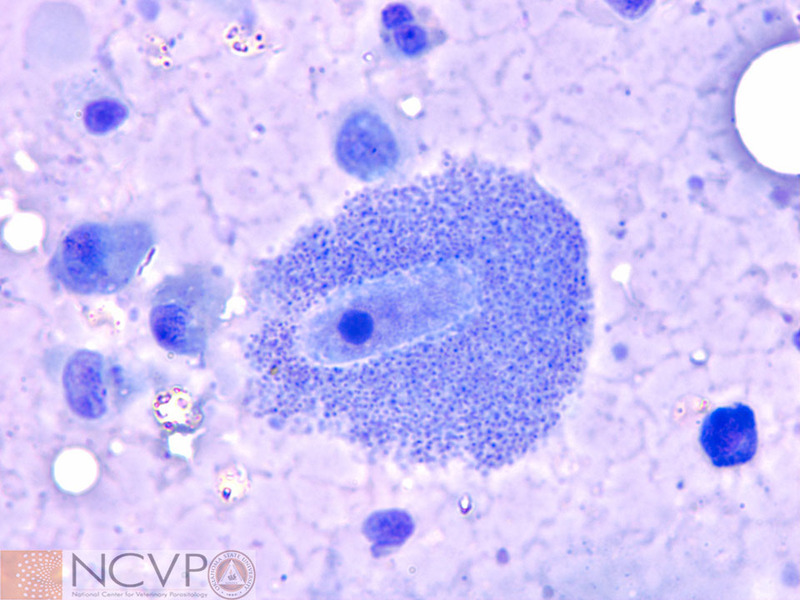 Gamont of Hepatozoon americanum in a leukocyte on Romanowsky stained blood film from an infected dog. 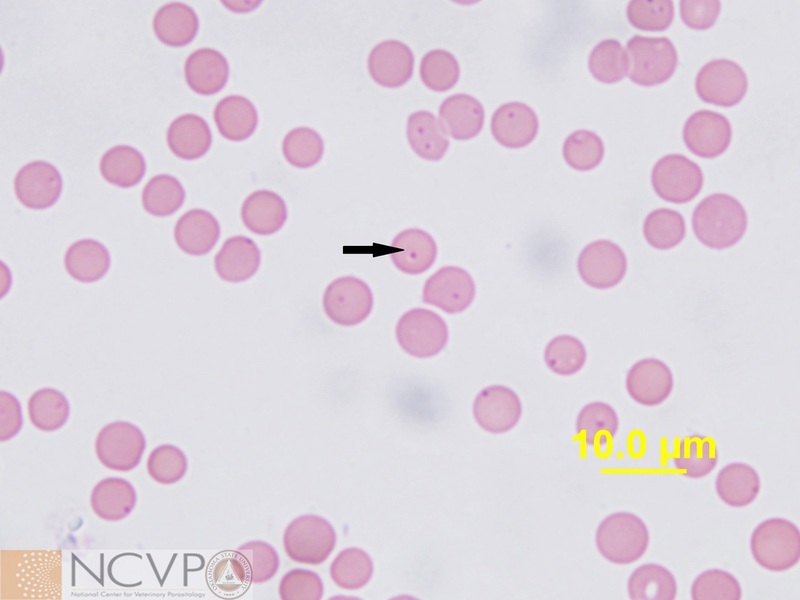 Gamonts are rarely seen on blood films, as parasitemia is typically extremely low. Gamonts are the infective stage to feeding ticks. ​Transmitted by Rhipicephalus, Hyalomma, and Dermacentor species. Romanowsky stained blood film with numerous erythrocytes containing Theileria equipiroplasms, the infective stage to feeding ticks. Equine piroplasmosis is endemic in parts of Asia, Africa, the Middle East, and Central and South America, but has been introduced into the United States on occasion.